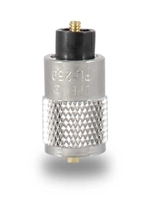 The Smiley Antenna Company has developed an outstanding flexible antenna that will simply screw into several antenna bases to fit Motorola, Tempo, Standard, Wilson, RCA, Repco, GE and all other transceivers using BNC, TNC, MX, SMA, or PL-259 connectors. See the chart below for easy reference to your radio need. User friendly: All bases field changeable for radio. In-use connectors can be ordered separately.